This review is of the Custom Subscription Bundle, $39.99 a month, box. The Products: 5 Puracy products of your choice. You can mix and match from any category making it truly customizable. You can also add up to 3 additional items to your bundle with the “Add-Ons” feature. Each add-on is 25% off the cost listed online for individual purchase in the Puracy Company online store. The products are packaged with a safety seal and in individual bags. Unfortunately, my first shipment was severely damaged. The box had a massive hole in it and two products were completely destroyed. I emailed the company and within 24 hours they had emailed me back asking what has broken so they quickly send me replacements. Here is the packing slip for the replacements. The original packing slip was destroyed in the mess. The replacements arrived in no time. I was extremely happy with their customer service. The Puracy Custom Bundle allow you to add any products from any line you want. It ships monthly, but you can swap out any products to create a different bundle each month or keep it the same, it’s up to you. Regardless of what you put in your bundle, it is a set amount of $39.99 for the custom bundle. For my particular bundle, this saved me $26.96 off of paying full price for each product. This is about a 40% discount. I love the subtle scent of this green tea and lime cleaner. I was stunned how well this cleaned my counters. This is one of the better cleaners I’ve tried and I have found myself reaching for this over my other cleaners since receiving it. There are two things I love about this cleaner: the first is that the pump doesn’t drip and is super easy to dispense without putting too much in. Second, this detergent was shockingly effective, yet gentle. I used this on my toddler’s clothes which were covered in dirt and food, after the wash they looked perfect. I didn’t expect it to work so well given how gentle the formula is without any of the normal harmful chemicals. This is one of my favorite new detergent discoveries. The scent of this body wash smells subtle (like all the other scents of this brand) and relaxing. I love the easy pump and my sensitive skin hasn’t had a single problem with this wash. I feel clean and refreshed with this wash. Again, I am shocked by this line of products. This lotion was probably my least favorite of the products. It had a lovely scent but I felt like it didn’t provide enough moisture for my liking. It is definitely a lightweight moisturizer. The one thing I liked a lot about it was how quickly it absorbed. I loved this product for my son! It was tear-free and super gentle on his skin! I like combo shampoo and body wash for him since it makes life easy. He didn’t mind it and I loved the citrus scent. It made him clean without any irritation. I will definitely get this one again, especially with the pump, making washing him convenient. Verdict: The quality of these Puracy products and the ease of customization of the bundle blew me away! For $39.99 including free shipping, I received $66.95 worth of products and am so happy with 4 out of 5 (the lotion was just ok to me). I definitely found products I’m now completely hooked on and I am excited to swap out some others to try more of their line. I’m now curious about their other offerings given how happy I am with the products I’ve tried. Can you still get this box if you sign up today? 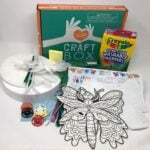 Each box is totally customizable, so yes, you can order at any time. Check out more Home Essential boxes in the Home Subscription Box List! What do you think of Puracy? I am definitely interested in this sub. When I use down some of my product I’ll have to sign up. Thanks for the great review! I am always looking for natural, cruelty-free products and they have some nice looking household products. It was a delight to review! You are most welcome. I’ve wanted to try this brand forever. I just couldn’t pull the trigger due to the prices. Thank you for the review! The monthly bundle makes it so much easier on my wallet. The bundle is definitely awesome! I’m so glad you like it! I just bought some of the stain remover off of amazon because it has amazing reviews, and apparently gets out baby poo! Had no idea they had a sub box! Haha I would love to hear back about whether it truly gets rid of baby poo!!!!! I’ve been switching brands a lot w. My kid in general.. esp body products because a lot irritates his sensitive skin!!! I haven’t tried this brand yet because it’s a bit pricey! The subscription looks promising though lol.